Plantar fascia? Say again please? Your plantar fascia is as vital a piece of equipment as those new running shoes or cushioned socks you just purchased. Care for it, and it will serve you well. Ignore it, or push it too far, and your running days could be over. The plantar fascia is a ligament that stretches from your heel bone to each of your toes, attaching one to the other. The plantar fascia covers the muscles, tendons, and nerves that run over the bottom of the foot. It acts like a taut bowstring, and plays a big part in maintaining a healthy foot arch. Plantar Fasciitis: Pay Attention to That Heel Pain! Many people tend to ignore a little pain in their heel. This is especially true of runners, who may take some ibuprofen and keep on going. Bad idea! One of the first symptoms of plantar fasciitis is heel pain, especially when you take those first steps in the morning. Left untreated, this condition could put an end to your running days. It could develop into more serious conditions, like plantar tears, plantar rupture, or plantar fibromatosis. Heel spurs are another common consequence of ignoring plantar fasciitis. Heel spurs are bony deposits that dig into the fatty pad of the heel. They may not be noticeable at first, but when they are, walking can become extremely painful. The stiffness and pain you experience in the morning may get better after a few steps, but will worsen as the day goes on. It can hurt to climb stairs, or to stand for any length of time. Pain will get worse after exercise. The good news is that there are steps you can take to prevent plantar fasciitis, and not let it interfere with your training. Modify your running style!Strengthen your feet! Believe it or not, going barefoot or wearing slippers is actually hard on your feet. If you need to, put on supportive shoes as soon as you get out of bed. Foot taping has been used both to prevent plantar fasciitis, and to relieve current pain. Proper taping can allow the plantar fascia to rest, so that recovery and repair can happen. So, pay attention to any pain you’re having … it’s telling you something! 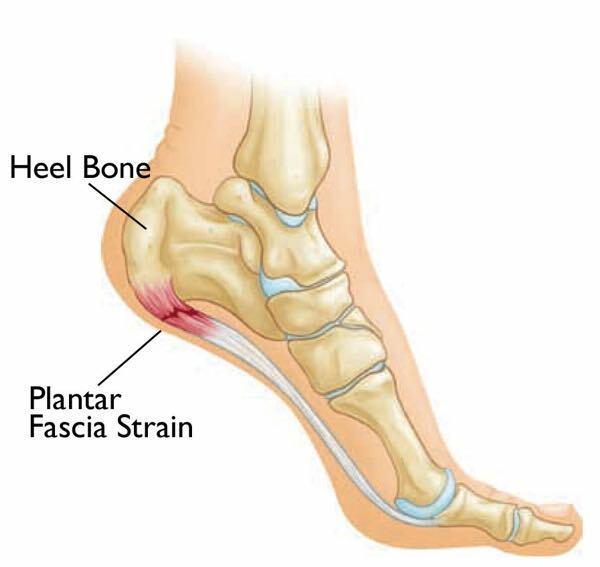 Take care of your plantar fascia, and look forward to many years of pain-free running ahead! Ask your Foot Clinic podiatrists how we can help you fix your feet. Read more about other types of heel and ankle pain you might experience and how we can help you.